Where do I begin? I was recommended this book. I thought it sounded just what I was looking for. What I found was a book full of the "f" word and plenty of teen drinking. I liked the plot of the story very much. 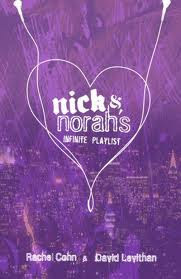 I liked how music brought Nick and Norah together. I liked their crazy night together. I didn't liked all the bad language. It could be just me, but I never used that kind of language in high school. I'm not just talking about a few bad words here and there. I'm talking 22 f-bombs on one page alone, then the next page had 10 f-bombs. It was plastered all over the book. Were there no other words for the authors to use? Also, the drinking. I never drank in high school. Neither did my friends. Is this rare? Maybe. But I was too busy with a load of after school clubs and such to be doing anything illegal. HOW was Norah getting drinks at the bar anyway? She is underage. I think authors need to be careful what they put in books (that goes for tv too). Kids think this is normal, and then they want to do it. To be normal. What's wrong with being a teen? The plot was good, I liked the characters, just not their language and some of their actions. Good story, I just think the bad language took away from the story. "I want to kiss her without counting the seconds. I want to hold her so long that I get to know her skin. I want, I want, I want." I haven't read this but I did see the movie and I'd agree that it's teens at their worst when it comes to responsibility. I'd highly recommend GRAFFITI MOON when it comes out next Valentine's Day. I did a brief review of it already.